eXporter is the add on module which primarily helps bridge the gap between Total Materia and computer aided engineering (CAE) software. Whether you want to move data from Total Materia directly to CAE software or simply export in excel or .xml, eXporter provides all the functionality you need. 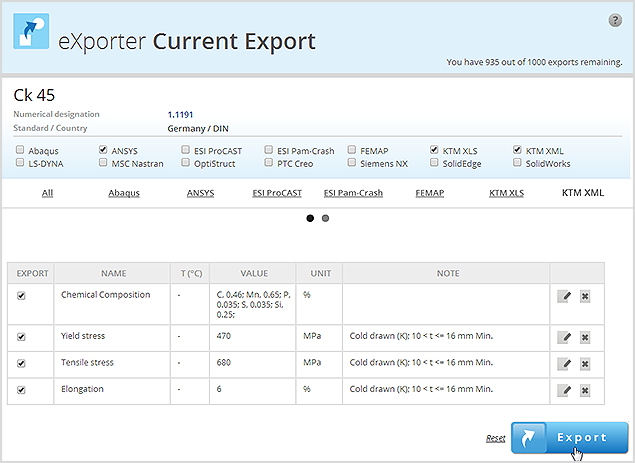 It is possible to export data from our 3 main data modules, Total metals, PolyPLUS and Extended Range. Included solvers formats available include ANSYS, Abaqus, MSC Nastran, SolidWorks, Radioss and many more. The first step is to identify and search the material from which you want to export properties. This can be done through the quick search or advanced search pages. To view the available properties for the chosen material you can then simply access these first through the subgroup page and then through the handy side bar navigation section. Next to each data set available for download you will find a small, blue, add to export button. When you click on the button you will be able to see exactly which software formats will support the export of this property. Tip: You are effectively creating a file compatible with a specific CAE software and so there are sometimes differences between which properties these solver formats will support and accept. Once you are satisfied with your chosen data you can move to the main exporter tab to review your selections. The default view is set to All which means you can see all selected properties in the table presented. To make changes or add notes to the data you can simply click on the edit button next to the relevant property data. Once you have made your change click the save icon. 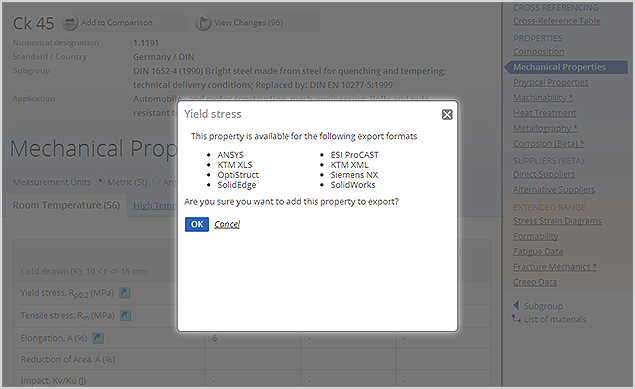 Above the export table it is possible to preview which properties are available for export according to each specific solver format. You will notice some differences here, for example, the ANSYS format supports the export of yield stress, but Abaqus does not. Tip: Total Materia also offer two proprietary export formats to xls and xml formats for more simply data requirements. To select which formats you want to export into, you can simply make single or multiple selections using the check boxes under the main material information. To begin the export, click on the export button and then simply open or save the files to your machine ready for use. 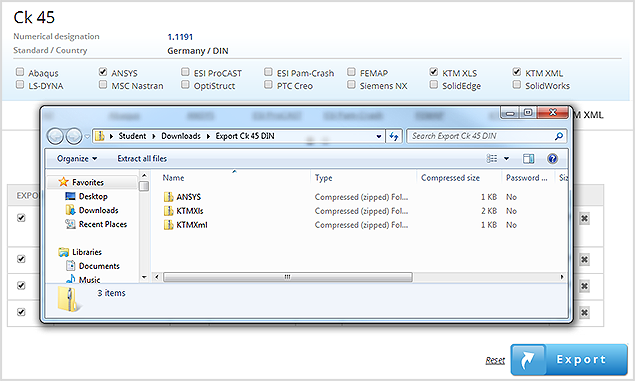 Exports will be presented in a zip file which can then be simply extracted and viewed in a standard manner. Tip: To make life even easier Total Materia provides you with an option to view and add previous export selections to the clipboard without the need for trawling through each dataset. Click on the previous exports sub menu button, view and select and your previous export will be made available in the main export data table.